I've been having the most difficult time getting the #4 stud into the head. The head was stripped after the last intake install, so I tried getting a set of inserts turned into the hole. It took me forever to get the threading such that the insert would twist in, and I just today got it done. 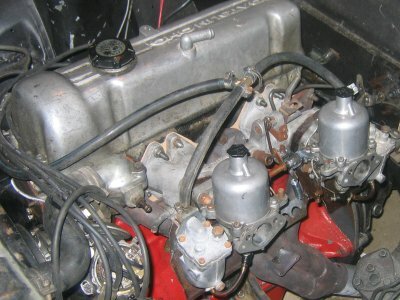 I've got the fuel line hooked up with a t-connector, and now I have to get the coolant passaged t'd as well. That should be all it takes to get the engine running. I still have to get the exhaust hooked up too... which, in hindsight, I should have done before I bolted up the header.